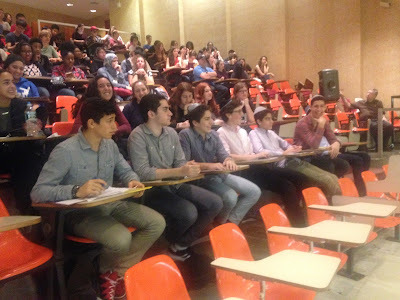 On Thursday, October 29, 2015, a group of fifteen Yeshivah of Flatbush sophomores from Ms. Weinstock's Chemistry class attended the Brooklyn College Chemistry Day. The day began with an impressive display of chemistry experiments and demonstrations. Next, the students were given a tour of the science labs on the college campus. Students were introduced to a mini museum of obsolete objects, where they saw how the applications of technology in chemistry have progressed over time. They were then introduced to real chemists who spoke to them about their current research, methods of accumulating data, recording data, and the goals of the chemists' research, each with a different emphasis on their own cause, and the means to achieve it. An award ceremony followed lunch; we are proud to announce that Yeshivah of Flatbush's representative was Yaron Sternberg. The final part of the day was a competition between all participating schools. The students had to work as a team to design a lab coat for their teacher. The students' creativity flourished as they all made contributions to what ultimately resulted in a job well done! The students all truly enjoyed the unique opportunity and were so excited to participate!